Satrangi Syaahi (Hindi Poetry) by Surendra Kumar Gupta, Neha Jindal. As the rainbow deck up the sky with its beautiful mesmerizing colours, in the same way a human heart is an enchanting canvas of colourful emotions. The stark red paints love and passion, blue the gloom, the bubbly pink immerses you in the carefree memories of childhood and white depicts the gravity of mood. 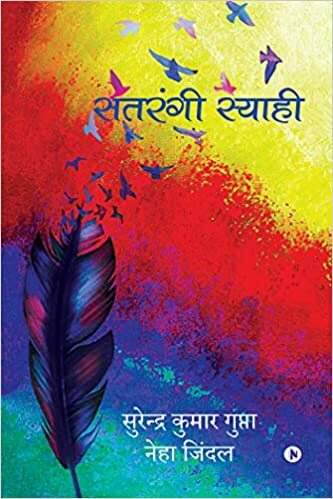 Satrangi Syaahi is one such collection of beautiful Hindi poetry that captures vivid emotions of human heart and takes you on a beautiful journey, Life. 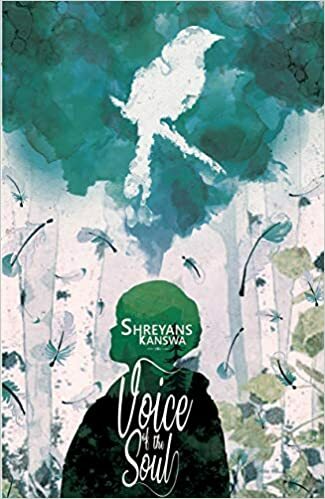 This collection of poetry is a reflection of emotions of two authors Surendra Kumar Gupta and his daughter, Neha Jindal (author of Phases of Moon). Experience the colours of life through this emotional web of words. Satrangi syahi is a collection of poems from different themes weaved into one book of revelation. Co-authored by two people some poems are by one and then the other. The title is okay as per the content of the book. Cover is colourful and composed. The blurb doesn’t give much about what the book contains or what kind of poem. I thought the book will be random poems from different walks of life but then it consists of sections such as vyang,Bundelkhand ke Gaurav,deshprem,bhavbhini and chanikaaye. The book has 53 poems. They vary in length some being 4-5 lines and some extending more. Some poems in the book really spoke to me. I wasn’t expecting Patriotic poems in the book but they were written pretty good as well. Keen observations and feelings that we go through have been put up in the poems. Some poems will exactly be like how you perceive upon a topic. A good book but I was expecting more. A short read but will definitely refreshen you up. How does it feel to lie just by yourself and delve into the silence. The silence that is a path to deeper self, a self that is unexplored. That same unexplored self can also be regarded as the soul. While the time ticks on the clock, a bond with your soul is timeless. Such metaphors are rendered powerless when a conversation is created with oneself. These poems mean more than just words, they scream soulfulness. It is rather weird that we go looking for answers outside when all that we have to do is seek deeper within ourselves. The poems are experiences that the poet shares with the world, and these experiences are nothing fancy- they are all moments that the poet experiences with himself. They are questions risen from inquisitiveness and introspection. The cover is a beautiful depicting so much about oneself. The poems range from variety walks of life. The poems are written poignantly trying to get the essence of life and nature together. Alot of new words you will get to learn. The title is what really makes it all the more beautiful. How a soul has so much within that we could envelope it into such little words and feelings. Theme of the poems vary accordingly from love to nature. The poems are really relatable to everyone we might have felt so one time or the other. The imagery formed by every poem takes you through different emotions and in sets where you keep wondering. Overall a beautiful book of poems giving more insight to oneself and to life. 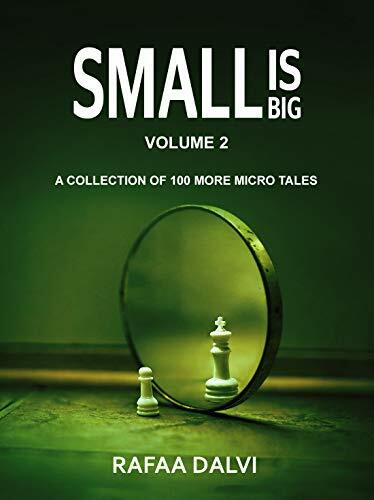 With Small is Big – Volume 1, Rafaa Dalvi is back with Small is Big – Volume 2 and he has created a potpourri of 100 more micro talesthat will provide you a rich experience and the best part is that there’s a story for everyone, including YOU! How frail are our hearts and bodies to be stirred up by one glass, one glance, one smile, one voice and one touch. So I bought a telescope to find which planet I was from. She bid farewell to her sister and left the graveyard, holding the hand of her brother-in-law. Identity theft was child’s play for twins. So what are you waiting for? Scroll to the top of this page, buy the book and start reading today. Rafaa Dalvi is a vibrant mess of innumerable thoughts, quotes and movie dialogues, who tries to escape from the mundane with words and contemplates about befriending the voices in his head. He dreams about changing the world, one smile at a time. Already published numerous times, his stories can be read in the anthologies – Curtain Call (editor), Kaleidoscope, Myriad Tales, and many more. He has written two volumes of ‘Small is Big’, which is a collection of 100 micro tales. He’s the recipient of Indian Bloggers League Booker Prize 2013 and a Select Writer at Terribly Tiny Tales. Small is big has two microtale collections. I’m sure the first one is as amazing as this one! The cover depicts the title. The cover seems simple yet could have been much better. The title is really apt for this little amazing collection which leaves you wanting for more tales. This book is definitely a short read but has such a huge impact over your emotions. One minute reading a tale you could be happy other tale could make you sad. This book is a rollercoaster of emotions and all the voids inside of us. What I really like is the way all the keen observation of the author has been put up into tales. All the things that constantly keep happening around us most of it has been put up into microtales. I really liked how a few microtales felt like poems. So many of these microtales will make you content-sad-questioning yourself. So many of these tales have more than two meanings to it. This book might be consisting of microtales but definitely more than 100 stories in it. The tales range from love to 21st century cliches and all the daily chores that take place. I really love how this book is a mixture of all the things we feel! I really enjoyed reading this book! This book is so relatable and deals with so many topics at once! You should definitely grab your copy right now tooo! Today’s instant make-up, instant break-up generation have no time to spare time at all. They prefer enjoying eternity in moments to waiting eternally for that moment. Hence, these micro tales have become the latest fad. Minuscules is a collection of unique micro tales and short stories that are spread over various themes. From horror to social issues to romance, these tales leave no topic unwritten about, no emotion unexplored. Though told with brevity, the impact of these stories can be more lingering than that of novels. To-the-point, poignant, relatable – this micro fiction book can be read by anyone in today’s time – a teenager and an adult alike. Its varied range of themes is the cherry on the cake. Minuscules is a book that is sure to bring a smile to your face and tears to your eyes – and stay with you for a very long time. May the stories make a home in your heart! Don’t leave me the way you leave others. Some things are permanent indeed. Let’s begin with the cover it is simple and really poigant denoting love and stirs in something of nostalgia within us. 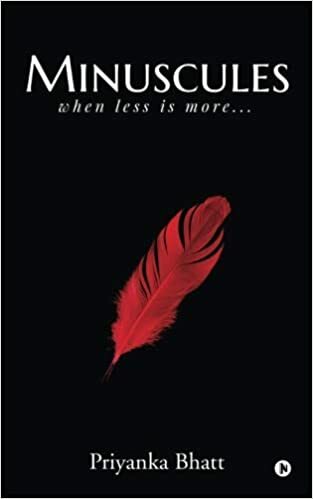 Black and red colour are always a win win!The title really goes hand in hand with the content as it is all about small poems/quotes/stories which will leave you to think. I really loved the essays in the book as well. A short read with so many topics to think about and know. You will definitely enjoy the macro stories as with in ttt tales. The way the author has put it is brilliant. a different book to help you feel light during the day. A book which might have all the thoughts you might be thinking. The book helps you realise alot of mental health, love, sacrifice and so much more. The author could make you feel and that is all that is needed by the reader. I enjoyed reading it and reminise alot of memories. I guess you will too! WE CAN, WE WILL, WE MUST – A story of love & inspiration to win life when it hits you hard by Saranya Umakanthan. Just finished reading this book a while back and it left me thinking about life how unpredictable it is and works in it’s mysterious ways. I was wondering how the author had put up so many incidents from Samaira’s and Vivians life. It feels like day to day life consisting of so many problems on a personal level. This book has so many elements to it romance, forgiveness, new start and above all hope that engages us to deal with today more over now. Having read so many mooshy romantic books this one is also amongst them with the happy ending but with twists. The distance between the two lovers makes the love more worthwhile. The story starts with everything being lost and in the end everything falling together. Each chapter begins with motivational quotes which adds to the story. I always love these galaxy covers. The title depicts hope and togetherness. A simple story with twists. A one time read. The author carries the readers along. The way every incident has been described also increases the connection in the story. 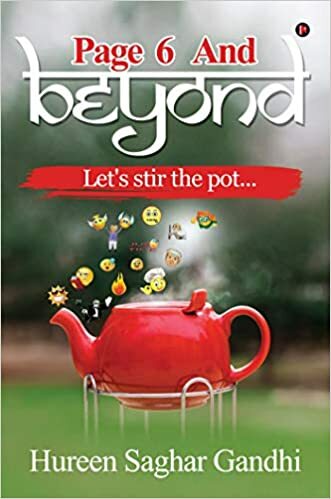 In Conversation with Author of Page 6 and beyond :Hureen Gandhi. While conversing we found out a little more about the book. 1)The blurb makes us all curious. Can you tell us a little more about the book what does it include? The underlying theme of the book is to enjoy living each and every moment in life while keeping one’s sense of humor. The book has me a first-generation immigrant resident of the United States living an ordinary suburban life with my family. In my daily life, I come across various characters with their idiosyncrasies. The book is about how I embrace each of these characters. The dominant framework is my school’s WhatsApp group where my classmate’s unbeknownst to them have become the source of my inspiration for many of the sensational stories. 2)How did you start writing? What does it mean to you? My funny bone triggered when I had my first born 12 years back, and I decided to be a stay-at-home mom. My writing skills, however, was a discovery. I stumbled upon it only a couple of years ago when I started to write a humorous column “Page 6” on my school WhatsApp group. I write to make myself and others laugh. It also helps me self-reflect and muse over my fond memories and experiences. 3)Is this your usual genre to write? What else do you write about? Any new works? Yes, humor is the only genre I have officially published. New work- I have some ideas penned down. It will just be a matter of time and the right trigger. 4)Your favorite authors? What are you currently reading? I enjoy a wide variety of the genres. My favorite author is Dan Brown. Amongst humor authors, I loved Twinkle Khanna’s Mrs. Funnybone. I borrowed the framework of my book from hers, and am thankful to her to inspire many of my personal accounts that have made it to my book. I also enjoy Anuja Chauhan’s sense of humor. 5) Any tips for our writers and readers? You are never too old to pursue your dreams. Don’t let age and experience stop you from doing anything you wish to do in your life. It’s passion, hard work, and perseverance that will lead you where you want to see yourself. Tip for writers – Make your first draft free-flowing, unobstructed, devoid of any self-criticism. Tip for readers – Page 6 And Beyond is a light read. Although the events in the book are connected, you can still open any chapter of the book and read it on its own. In addition, watch out for the intricate illustrations done to support the narration. To understand some of them, you have to read the complete chapter and come back again to admire the idea and work done in illustrations.